Boston Red Sox second baseman Dustin Pedroia managed to play just one game in his return from the DL before his knee sent him right back to the injured list. Pedroia was activated from the DL on Tuesday after a brief stint on the DL due to knee inflammation. He played that night in a win against the Tampa Bay Rays. But he did not play on Wednesday or Friday because of swelling in the knee, prompting the Red Sox to put him back on the DL before their game against the Yankees on Saturday. 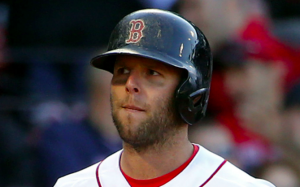 Pedroia underwent surgery on his left knee at the end of last season. But after he collided on the base paths with Baltimore’s Manny Machado in April, the knee became an issue once again. He’s played through pain for much of the season before finally going on the DL earlier this month. The Red Sox know they will have to monitor Pedroia’s knee closely for the rest of his career. He has four years and $56 million left on his contract after this season. In the short-term, the Red Sox are hoping Pedroia can return to being an every day second baseman at some point this season. Before going to the DL earlier this month, Pedroia was enjoying a productive season. He’s hitting .303 with an OPS of .784. He’s also a veteran leader for the Red Sox, and his mere presence is capable of giving the team a lift. At the moment, there is no timeline for Pedroia’s return from his latest stint on the DL. But the Red Sox are confident he’ll be back at some point this season once the knee problem is under control. In the meantime, Eduardo Nunez will continue to get the bulk of the playing time at second base. Fortunately for the Red Sox, Nunez was having a productive season before he was acquired from the Giants, and he’s been swinging a hot bat since the trade to Boston. With the Red Sox, Nunez is hitting .407 with an OPS of 1.179. Of course, as well as Nunez has played since coming to the Red Sox, Boston needs to get Pedroia back for the stretch run. The Red Sox are trying to hold off both the Yankees and Rays atop the AL East. They would also benefit greatly from his postseason experience, assuming the Red Sox reach the playoffs. Even with viable replacements, Pedroia would be a huge loss for the Red Sox if he can’t return and be productive down the stretch.